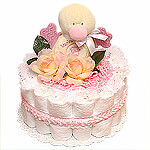 Any baby shower diaper cake here looks great and makes a great gift. Your gift will not be only cute but also very useful to expecting mother when baby arrives. We selected the best products that are essential and for certain will be needed during the first days of a newborn's life. 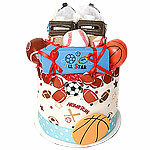 Each baby shower diaper cake is made of premium diapers and has also small toys, lotions, cremes, brushes and more. 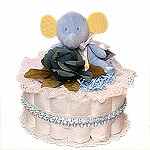 Please read description of individual baby shower diaper cake for detailed information. 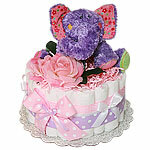 You can also view our separate collection of large diaper cakes for baby showers.